Poetry. Literary Nonfiction. Essays. Native American Studies. 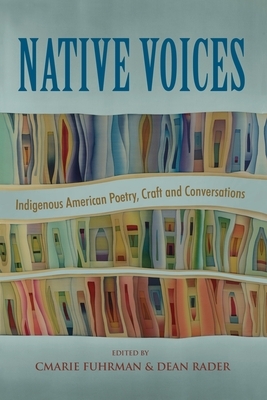 NATIVE VOICES is a comprehensive collection of the most urgent Indigenous American poetry and prose spanning the mid 20th Century to today. Featuring forty-two poets, including Simon Ortiz, Leslie Marmon Silko, Luci Tapahonso, Joy Harjo, Sherwin Bitsui, Heid E. Erdrich, Layli Long Soldier, and Orlando White; original influence essays by Diane Glancy on Lorca, Chrystos on Audre Lorde, Louise Erdrich on Elizabeth Bishop, LeAnne Howe on W. D. Snodgrass, Allison Hedge Coke on Delmore Schwartz, Suzanne Rancourt on Ai, and M. L. Smoker on Richard Hugo, among others; and a selection of resonant work chosen from previous generations of Native artists. CMarie Fuhrman is the 2019 recipient of the Grace Paley Fellowship at Under the Volcano in Tepotzlán, Mexico, and winner of the Bank’s Award for poetry. A 2019 graduate of the University of Idaho’s MFA program, she is the Project Coordinator for Indigenous Knowledge for Effective Education Program (IKEEP). Often anthologized, CMarie’s poetry and nonfiction have appeared in Yellow Medicine Review, Cutthroat a Journal of the Arts, Whitefish Review, Broadsided Press’s NoDAPL compilation, High Desert Journal, Sustainable Play, Taos Journal of Poetry and Art, among many other venues. She currently serves as Poetry Review Editor for Transmotion Journal. CMarie resides in West Central Idaho. Dean Rader publishes widely in the fields of poetry, visual culture, and Indigenous Studies. His scholarly books include Engaged Resistance: Contemporary American Indian Art, Literature, and Film from Alcatraz to the NMAI (University of Texas Press, 2011), which won the Beatrice Medicine Award for Excellence in American Indian Scholarship and Speak to Me Words: Essays on Contemporary American Indian Poetry (University of Arizona Press, 2001, edited with Janice Gould). He also curated a special issue of Sentence devoted to contemporary Indigenous prose poetry. Rader’s most recent collection of poems is Self-Portrait as Wikipedia Entry (Copper Canyon), a finalist for both the Northern California Book Award and the Oklahoma Book Award. He also co-edited Bullets Into Bells: Poets and Citizens Respond to Gun Violence (Beacon Press). He is a professor at the University of San Francisco.